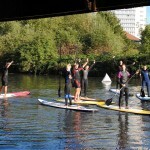 Last weekend I was invited to play in the first SUP Ball game in the UK. Having never even tried SUPing before I was slightly apprehensive, intrigued and excited. I had been told to expect a cross between lacrosse (which I’ve never played), water polo, netball and rugby. I always love trying new sports and luckily there were some experts on hand to tell me what to do, or rather what not to do. 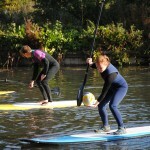 I immediately went for the one foot forward, one foot back stance on my board but was quickly told that for forward paddling you need to evenly weight the board by having two feet straddling the centre of the board about a shoulder width apart. Having sorted out my balance the paddling element came quite naturally to me and I was quickly heading in a relatively straight line along Brentford Lock, avoiding collision with early morning narrow boats. To turn quickly, there was another technique which involved inching towards the back of your board to swing the front in the direction you wanted to travel – I never quite mastered that one! The game is played in an unbounded area of water with 5 players on each team. The aim is to get the ball from one end to the other to hit an inflatable target. As soon as you’re in possession of the ball you can’t paddle, but you have the option to pass to another member of your team or throw the ball ahead of you and catch it up. The opposition can intercept throws and even rugby tackle you off your board to regain possession of the ball. There were more than a few comedy moments with multiple players all falling into the canal at the same time! My competitive nature was evident from the very start, it didn’t matter that most of the players were novices (including me), I was out to win…..and get wet! The game ended 8-2 to my team and I was absolutely buzzing afterwards. The game was a great combination of agility, tactics and team work and I thoroughly recommend giving it a go. 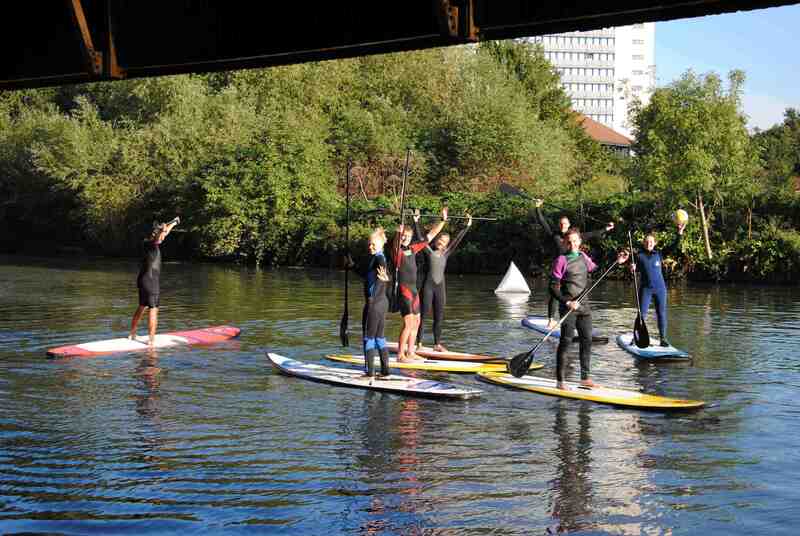 For more info on SUP Ball in the UK visit www.supball.co.uk and if you’re interested in taking part in a game in Cardiff, please drop me an email and I’ll see what can be arranged!